When you add oats to a cookie, it becomes totally healthy. Or am I having one of my delusional moments again? 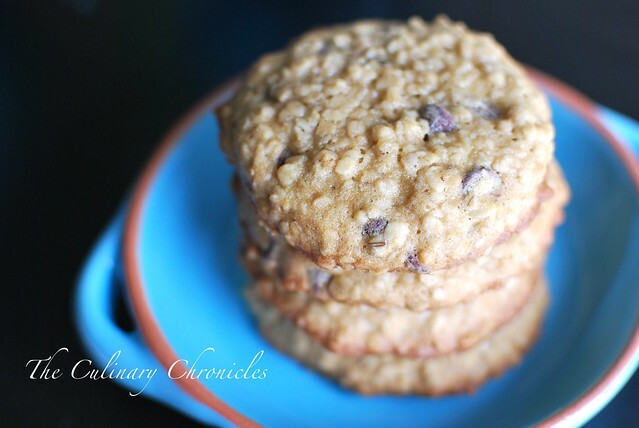 Though with 3 cups of oats in these Chewy Oatmeal Chocolate Chip Cookies, they could almost double as a granola bar! That settles it….I’m still calling them “healthy”. So please, don’t burst my bubble. Beat butter, sugar, and brown sugar together on medium speed until smooth and creamy. Add eggs and vanilla and mix until well combined. Scoop dough into rounded tablespoons and place on baking sheets about 2 inches apart. Lightly press down to flatten each dough ball. Bake for 9-11 minutes, or until done (these won’t look done at first glance, they’ll have a gooey, dough-y looking centers that sets when they’re cooling, so I baked mine until they were crispy & brown around the edges. You can always poke them with a toothpick if you want to be sure). Cool 1 minute on cookie sheets; remove to wire rack and allow to cool completely. Previous Post Passion Fruit Caipirinha…..Saúde! healthy enough. 6 tbsps of butter divided by 20 cookies = de minimis amount of fat. i am going to try making these and add shredded zucchini and call it a nutritional breakfast bar for the kids! I love oatmeal chocolate chip cookies. I haven’t made them in a while. You’ve just inspired me to make a batch! And this recipe looks great so I’ll have to try this one. Something almost like these is in my oven right now! These look so tasty. Since these are oatmeal based, bring them on!